Want flawless looking healthy skin without scars and marks? Cosmotree Clinic offers the best marks and scar removal treatment in delhi like Dermabrasion, Chemical peel, Laser etc in Delhi/Gurgaon, and Mumbai which are not too heavy on your pocket. 1. Dermabrasion: Cosmotree Clinic offers the best Dermabrasion treatment for scar removal treatment in delhi which is a non-surgical. skin treatment for improved skin texture, tone, and color. • Scars from accidents or disease. • Anesthetize the area to be treated. • High-speed brush to exfoliate the top layer of skin on your face to remove or reduce the depth of scars. • You will typically need several days to heal after the treatment. • The session takes anywhere between 20 and 40 minutes. • Few treatments are needed to fade out old acne scars and fine lines. • Generally, your skin can handle one Dermabrasion treatment each month. • Regular treatments also offer the best anti-aging benefits as well but also varies from person to person. Most people can resume their normal activities in seven to 14 days after dermabrasion. • Avoid sunlight for a few weeks. • Avoid makeup for 24 hrs. different kinds of chemical peels in Delhi/Gurgaon, and Mumbai for effective scar removal. • Superficial peel: This peel has milder effects and might improve pigmentation caused due to minor scars. You may also need to take antiviral medications to prevent illness. different laser treatments for scar removal according to skin and body needs, skin tone and texture etc. remove damaged skin cells and diminish scars. Your doctor may also discourage laser treatments if you take blood-thinning medications due to the risk of bleeding. • Can resume daily activities the next day. 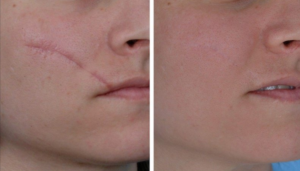 Laser scar treatments don’t make a scar disappear. Instead, they’re designed to make a scar appear less noticeable. • They basically smooth the skin to improve tone and appearance. • These lasers are also used to aim blood vessels in the scar tissue and reduce redness. • They can also enter the skin’s surface to speed up the production of new skin cells. • Resurfacing removes the outer layer of skin and skin cells that have been damaged. • You’ll be given a local anesthesia for the pain. • The dermatologist will run the laser over the scar to remove the damaged skin cells. • May use a carbon dioxide (CO2) laser for deeper scars or an erbium laser for surface scars. • Can be used easily on other parts of the body (other than the face). • Eliminating the existing acne scars. • Prevent new scar formation. • Eliminates dark pigmented cells. • Stimulates collagen production and skin cell renewal. • Make your scars appear less noticeable. • This laser therapy uses tiny beams of light that penetrate deeply into the skin. • The result is hundreds of microscopic holes where skin cells have been removed, surrounded by healthy skin. • The holes help break down old skin cells while accelerating collagen production within the deeper skin layers. • Need three to five treatments. • A week interval between treatments. the treatment and the results also vary from person to person. • This therapy is much less invasive and requires little to no recovery time. • A topical anesthetic will prevent pain. • Patients usually experience redness or minor swelling that diminish within a few days. • Speed up collagen production. • Stimulates Cell renewal to replace damaged skin cells. • A topical anesthetic is applied to numb the area. • Expect some mild discomfort during treatment. You can ask for sedation if you’re treating a larger scar. • Use infrared skin lasers to heat the inner layers of the skin while leaving the surface untouched. • 3 to 10 days for your skin to heal but varies from person to person. as increased redness or severe pain. • Avoid direct sunlight for few six weeks after the procedure. • Apply a cold pack to the treated area to reduce swelling. • Take over-the-counter pain medication when needed. • Wash and apply moisturizer daily. • For facial procedures, avoid makeup for a few days. repeated treatments in the future. It can be weeks or months before you see any actual results on your skin. It depends on your skin and the degree of scars you have and also varies from person to person. 4. DERMAROLLER: Dermaroller is a handheld device that has a roller with hundreds of tiny micro needles attached to it. Cosmotree Clinic use dermaroller for skin enhancement and cleaning treatment. Dermarolling is a skin treatment and is done by a hand-held device known as Dermaroller. • The dermaroller is rolled over the skin to create tiny skin punctures which help in skin repairing. • The whole process leads to the production of new collagen. • Results in suppleness and elasticity in the skin. • Very less time to heal. • Full recovery in 24 hrs- 7 days. Depending on the intensity of the treatment. • As for the side effects, some of them hardly last for a couple of hours and some may last for a couple of days. Generally, the treatment takes at least 4 to 6 weeks to show some results but it also varies from person to person. • Apply aloe gel to calm and soothe the skin. • Avoiding touching your face with dirty hands. • Avoid new and harsh skincare products. • Avoid sauna, hot showers until the redness has gone. area around a deep scar. 6. Ointments: Not very effective in treating scars and are often temporary. • Provides affordable scar removal treatment with great results. • Latest technologies and lasers like Q switched laser. • Visible results in less time. • Warm amiable environment with excellent hygiene conditions. • One of the top trusted brand in Delhi/Gurgaon and Mumbai for your aesthetic needs. At Cosmotree Clinic, you’re in good hands. Our specialists will provide you with the best scar removal treatment in delhi such as laser therapy, chemical peels, dermarolling etc to meet your cosmetic goals, and we’ll do our best to keep you comfortable every step of the way. Give us a call at 9999909292 to schedule a consultation today.